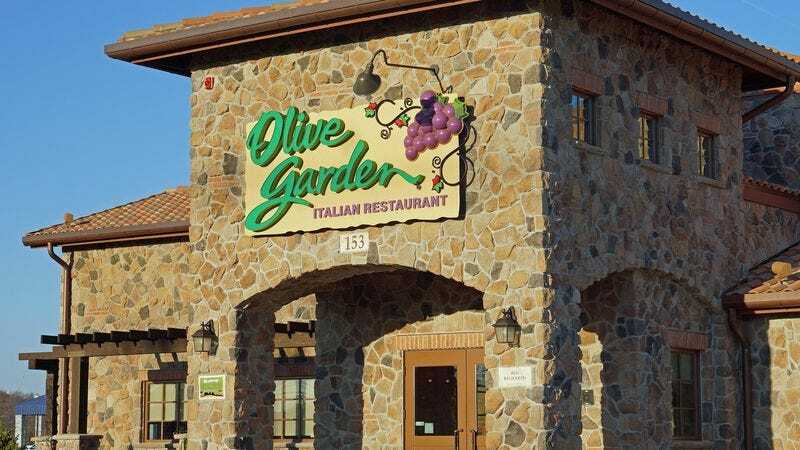 Not to be outdone by their amigos in cheese-related skullduggery over at Taco Bell, the ricotta ladlers at Olive Garden have announced their own “Never Ending Pasta Pass,” which promises their bearer unlimited pasta, plus salad, soda, and breadsticks—and caveats. Much like how Taco Bell’s own “lifetime of Taco Bell” contest puts a cap on the average Taco Bell eater’s lifetime at 46, the “Never Ending Pasta Pass” ends in a mere seven weeks—no doubt at the urging of its lawyers, who don’t want to see one of the leading causes of death next year be “canneloni.” But unlike Taco Bell, Olive Garden doesn’t require you to jump through various hoops (in a purely metaphorical sense, obviously). Instead, it offered up the pass to 1,000 people today for a flat rate of $100 apiece. Naturally, it sold out within minutes. Olive Garden is, of course, no stranger to “hospitaliano,” the Italian word for “overfeeding to the point of hospitalization.” Its unlimited bowls of salad and buttered bread truncheons have long been legendary among little high school drama club shits who didn’t even tip, while its “Never Ending Pasta Bowl” promotion remains its most popular and requested—mostly among people who are training for triathlons and work on Alaskan oil rigs, we assume. Most obviously, the “Never Ending Pasta Pass” was meant to do exactly what we’re doing right now—make us talk about Olive Garden, in a context outside of family arguments. “What we’re trying to do is get some attention,” Jay Spenchian, executive vice president of marketing, said while serving up an unlimited bowl of truth to USA Today. “It’s sure to provoke a reaction.” Indeed, getting lots of social media buzz is not the only way that Jay Spenchian and Olive Garden are being totally cool right now: “We’re trying to make our fans feel like VIPs,” he says, which is why up to seven guests who dine with pass-holders will get free Coca-Cola products, just like the celebrities drink. And while you’re not technically supposed to share any of that never-ending pasta with your guests—forcing them to sit there sipping their Cokes while you eat bowl after bowl, yelling, “I’M KING SPAGHETTI!” and laughing in their face—look, Jay Spenchian’s not gonna be a narc about it. “Of course, if someone shares we do understand—we’re not policing the tables,” he says, wink wink. He also said that he’d “love to see” pass-holders eating all of their lunches and dinners at Olive Garden for seven straight weeks, determined to get the most out of their $100 at any cost to their health. After all, you can’t buy pasta with your health. In keeping with these recent giveaways and others, like Red Lobster’s Endless Shrimp and TGI Friday’s Endless Appetizers, Applebee’s is expected to announce its own “Unlimited Sizzlin’ Colectomy,” free with literally anything on its menu.